Departs at 11am or 3pm daily excluding Mondays. Spring or Autumn to avoid the crowds of Summer. We are comparing Nice Sightseeing Cruise to Villefranche Bay Prices from leading ticket suppliers and Try to find you Cheap tickets prices on the market. The opportunity to admire the natural splendor of the Côte d'Azur, the playground of the rich and famous. Saint-Jean-Cap-Ferrat houses the luxurious yachts and villas of the rich and famous including the European aristocracy. Villefranche-sur-Mer is known for its natural deep water harbour, one of the deepest in the Mediterranean, and welcomes large luxury ships as well as also being a colourful fishing port. A great trip if you love to admire scenery - Anyone who enjoys sightseeing, photography, and the natural world will enjoy the cruise. The short 1 hour trip is the perfect way to admire the Mediterranean coastline if you're short on time. Good for solo travellers, couples, and families. Your Experience With Nice Sightseeing Cruise to Villefranche Bay? Board the boat at Nice port choosing to sit outside in the sun or undercover and cruise along the Côte d'Azur coastline admiring the views. See the famous Promenade des Anglais from a unique vantage point of the Baie des Anges, see the hilltop villages in the distance, admire the villas of the rich and famous at Saint-Jean-Cap-Ferrat and travel out to the deep waters of the famous Villefranche-sur-Mer to see the colorful fishing bay. 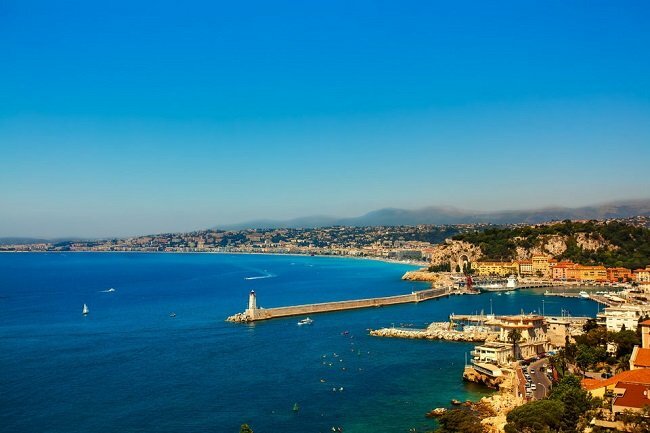 As you admire the spectacular coastal views and the clear Mediterranean water you will learn the history of the French Riviera and about the sights you are passing with live commentary in French and English delivered by the crew. Drinks are available to buy onboard for a reasonable price so you can just sit back, relax, and admire the coastline as you sip on a refreshing beverage. What Nice Sightseeing Cruise to Villefranche Bay Includes? A 1 hour return boat ride along the French Riviera / Côte d'Azur coastline departing from Nice port and traveling to the bay of Villefranche-sur-Mer. Live commentary by the crew in French and English. Arrive 20 minutes before departure to allow for time to exchange your e-ticket or printed ticket for a boat ticket at the harbour office and to get a good seat onboard. Travelers Reviews about Nice Sightseeing Cruise to Villefranche Bay? Travellers talking about this tour on Viator, GetYourGuide, and TripAdvisor give it good reviews and highly recommend it to others. Everyone was impressed with the scenery they got to pass and said they took lots of photos. Some travellers said that they found the English commentary difficult to understand but others said the commentary was superb and very informative. People say that they wished the cruise lasted longer as the time passed by so quickly! Printed tickets and e-tickets are accepted but must be exchanged at the ticket office before boarding the boat. Take a jacket, the sea breeze can be chilly.